Short summary on a single page of the most important LilyPond commands for professional music engraving. The Cheat Sheet is written in English, printed in full color and laminated for long durability. 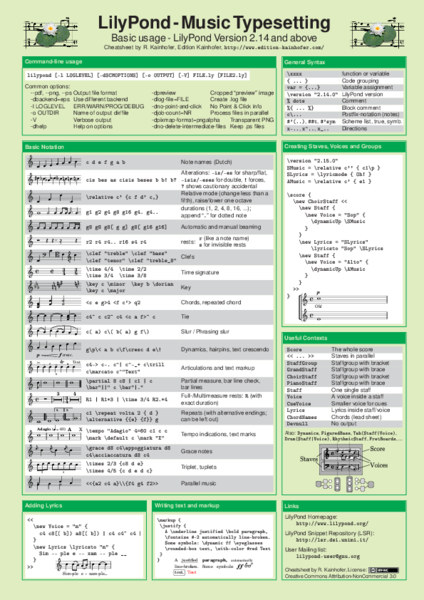 Short summary on a single page of the most important LilyPond commands for professional music engraving. The Cheat Sheet is written in English and be either downloaded here free of charge, or ordered here as a full color print and laminated for long durability. This approach does not impose any restrictions due to limitations of a GUI (graphical user interface) and thus gives the user greater control over the final looks of a music score. It also allows LilyPond to apply well-established engraphing principles and guidelines automatically without any user intervention to create music scores that look professional from the very beginning without much tweaking. The downside is that one has the remember the actual text commands - even if they are mostly rather straightforward and clear - to write a musical score. This cheat sheet helps LilyPond users by providing a short summary of all the necessary commands and functionality at a short glance.